RATHER more than two miles from the northern end of Cambridge is the picturesque village of Histon, surrounded by flourishing orchards, and famous for the ideal hygienic factory of Messrs. Chivers & Sons, the well-known jam and jelly manufacturers, whose fruit farms stretch in all directions. 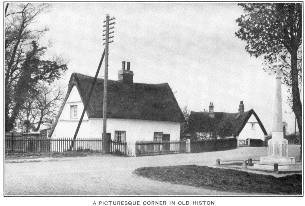 The village green with its old pump is a typical bit of English rural scenery, and is very properly the centre of much of the social life of the village, for here stands, as shown in the picture opposite, the fine Men’s Institute which is maintained by Messrs. Chivers for the use of the whole village. 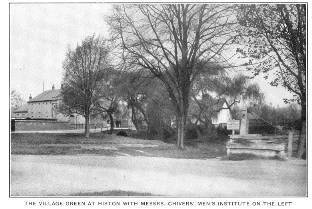 The Institute contains a Gymnasium, Lecture and Concert Hall, Reading Rooms, Billiard Room, Bath Rooms and other departments, and is well used by the people of Histon and the adjoining village of Impington. HISTON is a very happy combination of the old and the new. As seen by this illustration it has its picturesque stucco cottages with thatched roofs side by side with newer houses and the village is constantly growing. It is satisfactory to know that a large proportion of the employees have built or are building their own houses. Messrs. Chivers themselves have put up a number of model cottages which add to the attractiveness of the village. 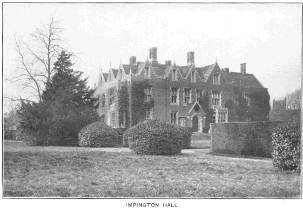 A few years ago the firm purchased the historic Impington Hall, referred to in the diary of Samuel Pepys, who stayed there from time to time. The Hall stands in a beautiful park, quite near to the factory and is now used for educational classes. 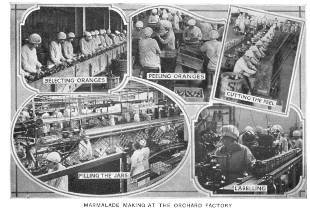 These are attended during work hours by all young people under 18 years of age, employed at the Orchard Factory. 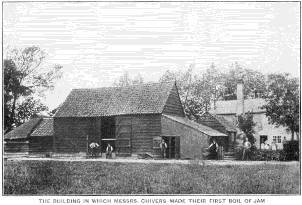 The growth of Messrs. Chivers’ business has been phenomenal. 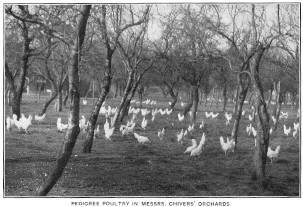 At the beginning of the nineteenth century a small estate at Histon was farmed by a Mr. John Chivers, who was so successful in raising fruit crops that very soon he had met all local requirements and had to seek a market further afield. He sent his fruit to London by road for there was, of course, no railway in those days. Mr. Stephen Chivers, his son, by careful thrift and business management extended the estate until he owned several hundred acres and it was his sons who inaugurated and developed the business of jam-making in the midst of the orchards. The old barn in which the first boil of jam was made in 1873 is still standing. Some idea of the development of this great business may be had from the illustrations on pages 16 and 17 (below). FOR over 50 years the business has gone on developing. The plantations have been added to until Messrs. Chivers now farm over 6000 acres, a large proportion of which is under fruit cultivation. Building after building has been added to the factory and to-day there are more than 14 acres of floor space with miles of passage ways, and, yet, despite the increase in size the factory still retains its rural character. The staff has increased correspondingly. and at the busy season of the year over three thousand persons are employed. 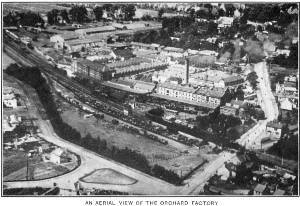 The firm makes its own cans and boxes and erects its own machinery; in fact the Orchard Factory is practically a self-contained town. It is quite easy to appreciate the tremendous advantage of having a factory of this kind, right in the country with the fruit growing all round. The bulk of the workers live in Histon or the other villages round, and hundreds of them come to the factory upon their bicycles. Others travel in from Cambridge, a special train and fleet of buses being arranged morning and evening for their benefit. Great care is exercised in the selection of these workers and their health and welfare are looked after by a staff of trained nurses. Adjoining the factory premises, stands an old country residence which now serves as an institute for the women and its beautiful grounds are open for their use during meal times and in the summer evenings. Nearby there is a large Recreation ground equipped for Football, Hockey, Tennis, Bowls, Putting, etc. ; there is also a part set aside for use by the children of the village. 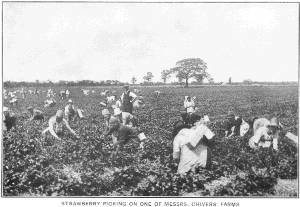 THE picture opposite (above) shows a typical scene on one of Messrs. Chivers’ fruit farms during the fruit picking season. In the selection of fruit pickers the same care is taken as in the case of the factory workers, and visitors during the summer frequently remark on the good appearance of workers found in the orchards. Special attention is paid to their welfare and health, and shelters are provided in the plantations for their use when rain comes on while the fruit is being gathered. Thousands of tons of highest quality fruits are taken direct from the firm’s orchards into the factory each year for Canning, Bottling and Jam making. 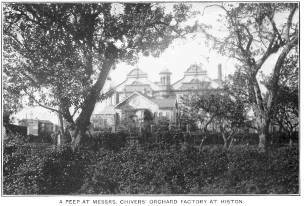 In addition to the extensive orchards in the Eastern Counties of England, Messrs. Chivers have several fruit farms in the vicinity of their factory at Montrose in Scotland. 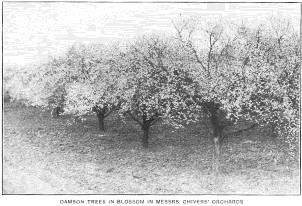 THE magnificent crops of choice fruits which are grown by Messrs. Chivers & Sons for their manufactures are not obtained by continuing old fashioned methods of cultivation. Under scientific supervision, hundreds of seedlings of new varieties including raspberries, strawberries, gooseberries, plums, etc., are raised annually. 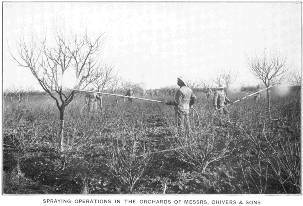 Messrs. Chivers have long made it their custom to raise all the trees and bushes required for the vast acreage of fruit land worked for the supply of fruit to the factory. The policy of propagating for the general nursery trade and private grower has also been pursued for some years with very great success. Spraying operations, as illustrated on the opposite page, are carried out on a highly scientific system. The spraying solution is pumped through main underground pipes to various points in the orchards where it can be tapped as required. DURING the months of April and May when the trees come into full blossom, the orchards present a wonderful sight as may be gathered from the illustration on the opposite page. This is a period of much anxiety owing to the disastrous effect of heavy frosts which very often occur during this season of the year. Herds of pigs and poultry by the thousand range freely in the orchards, and this illustrates rather strikingly an economic aspect of associating the industries of farming, fruit growing, and jam making. The pigs and poultry benefit by their wide freedom while at the same time they enrich the soil and, so far as the poultry is concerned, keep down insects. Further, residues from the Orchard Factory provide excellent feeding stuff for the stock. THE goods manufactured at Histon go to all parts of the world. They are found in the far northern districts of Alberta and Saskatchewan; they go to Australia and New Zealand; they are found in the United States and South America, in India, Japan and even in the very heart of Africa. Organisers of Scientific Expeditions to the Arctic and Tropical Regions usually include a plentiful supply of Chivers’ Products among their stores. Prompt and efficient despatch is an important part of a business such as this. A large proportion of the goods for home trade is conveyed in the firm’s own fleet of Motor Vans, one of which is shown in the picture on the opposite page. In addition many truckloads are despatched by rail every day from Messrs. Chivers’ private siding. In order to expedite delivery, depots have been opened at London, Manchester, Leeds, and Montrose. 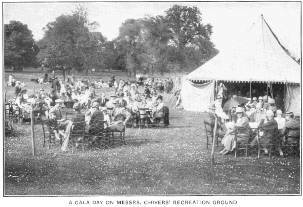 BEGINNING with Jams made from home grown fruit which was a seasonal business only, Messrs. Chivers have constantly added to their activities. 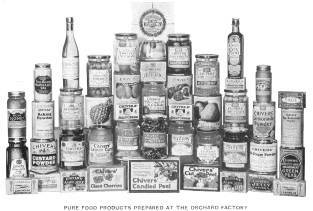 Well known products such as Chivers’ Table Jellies, Olde English Marmalade, Grape Fruit Marmalade, English Canned Fruit, Cambridge Lemonade, Jelly Cream, Lemon Curd, Plum Puddings, Mincemeat, Custard Powder, etc., enable them to keep the factory workers fully employed all the year round. The manufacture of these and all other products of the Orchard Factory is carried out under close technical supervision and each carries a guarantee of supreme quality and reliability. 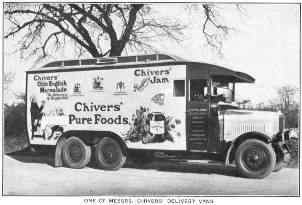 Messrs. Chivers have been honoured with the Royal Appointment as Purveyors of Jams, Jellies and English Canned Fruits to H.M. The King, H.R.H. The Prince of Wales, and H.M. The Queen of Norway. 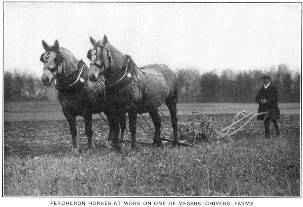 PEDIGREE Stock from Messrs. Chivers’ farms are in constant demand by Home and Overseas breeders. Their herd of Dairy Shorthorns was established about 25 years ago and numerous successes have been obtained at the principal Agricultural Shows throughout the country. There are also a considerable number of Apiaries distributed over the orchards. The bees are kept primarily for fertilising purposes, but the Packing of honey is also an important item of Messrs. Chivers’ business. There are over 150 Pedigree Percheron horses on the Histon farms and large numbers of pigs and poultry. A mammoth incubator with a 16,000 egg capacity has just been erected. 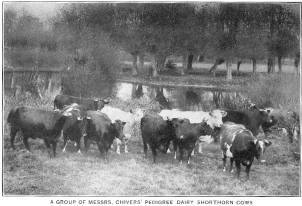 Pictures of the Dairy Shorthorns, Utility Poultry and Percheron horses are given on the next few pages.